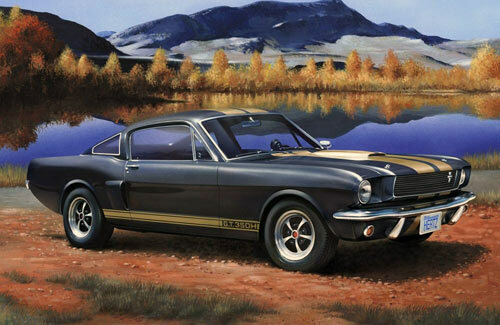 All Products > "67242 Revell 1/24 Shelby Mustang Model Set"
In 1964 at the international exhibition in New York an attractively designed coup� specially developed for the younger driver was shown to the public. This sporty and economical Ford Mustang, the originator of the "Pony Cars", was available from April '64 and within six months Ford had sold an unbelievable 680,000. In 1965 a high-performance version of the Mustang, the GT 350 built by Carroll Shelby with a 4.7 litre V8 engine appeared. The Hertz car rental company ordered 1000 of the GT 350 H (for Hertz) in black with gold trim, to enable their customers to rent "racing cars" and this 306 bhp exceptional Mustang very quickly found favour with them.